President Trump on stage at a Missoula campaign rally as the sun sets over the Bitterroot Mountains, Oct. 18, 2018. Trump holds Tester responsible for derailing his previous VA Secretary nominee Doctor Ronny Jackson. Tester is the ranking Democrat on the Veterans Affairs committee that made public allegations that Jackson abused alcohol, at times while on the job. Jackson declined to defend himself in a Senate confirmation hearing. Republicans say it was character assassination and liken it to the recent debate over sexual misconduct allegations against supreme court justice Brett Kavanaugh. “That’s really why I’m here,” Trump said. The crowd cheers President Trump during a campaign rally in Missoula, MT, Oct. 18, 2018. 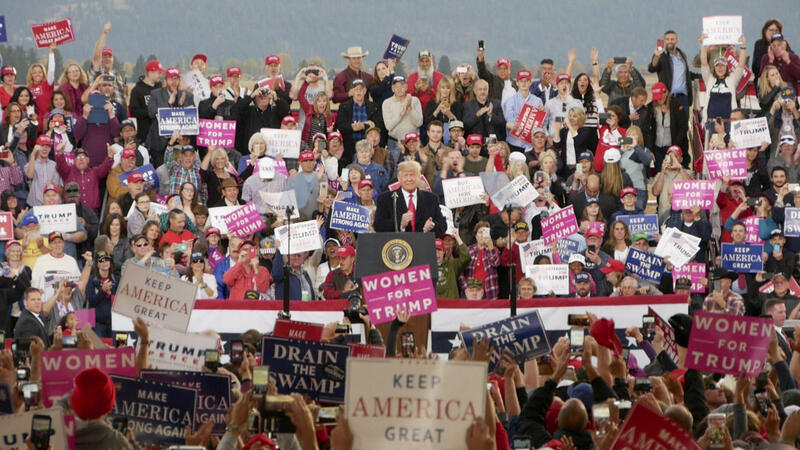 The president’s historic third visit to Montana in four months took place in an airplane hagner where thousands gathered wearing merchandise branded with Trump’s campaign slogan and name. Trump praised the size of the crowd there to see him. He attacked potential Democratic presidential challenges in 2020, and riffed on the accomplishments he says his administration has achieved over his two years in office. Trump called on both of Montana’s Republican candidates to join him on stage. U.S. Senate candidate Matt Rosendale speaks during a campaign rally with President Trump in Missoula, MT, Oct. 18. 2018. 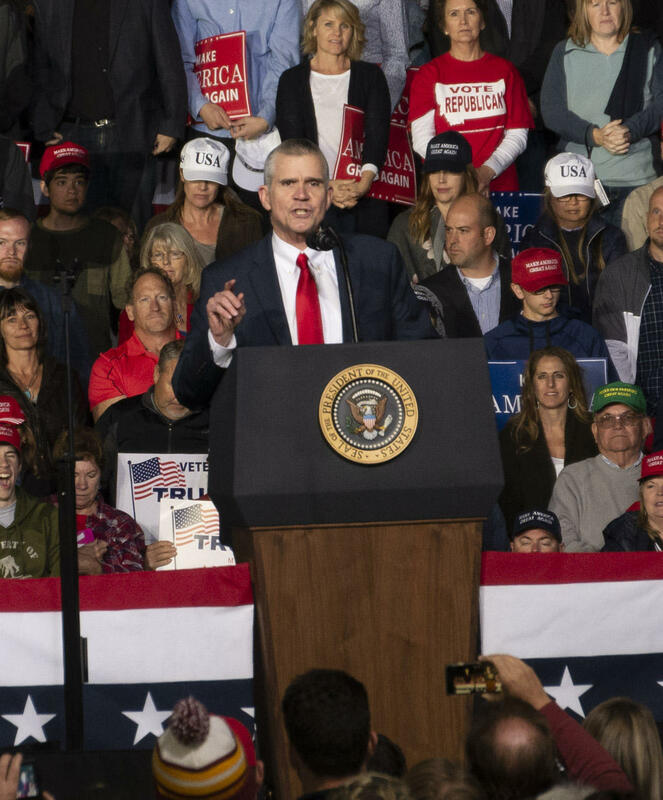 Senate candidate Matt Rosendale has defined his campaign by pledging to fulfill Trump’s campaign promise, to "Make America Great Again," a message that gave the president a 20 point win here in 2016. “President Trump deserves a senator from Montana that will support his Supreme Court nominees, not oppose them 100 percent of the time, like Jon Tester has done,” Rosendale said. Trump endorsed Montana’s incumbent Congressman Greg Gianforte, who is running against Democrat Kathleen Williams. While the Senate race is being closely watched across the country, the contest for Montana’s lone seat in the U.S. House is less high-profile. “Let me just say, on behalf of all of Montana, Mr. President, thank you for giving us hope, again,” he said. The crowd cheered as Trump praised Gianforte’s assault of a reporter last spring, saying anyone that can do a bodyslam is his kind of guy. 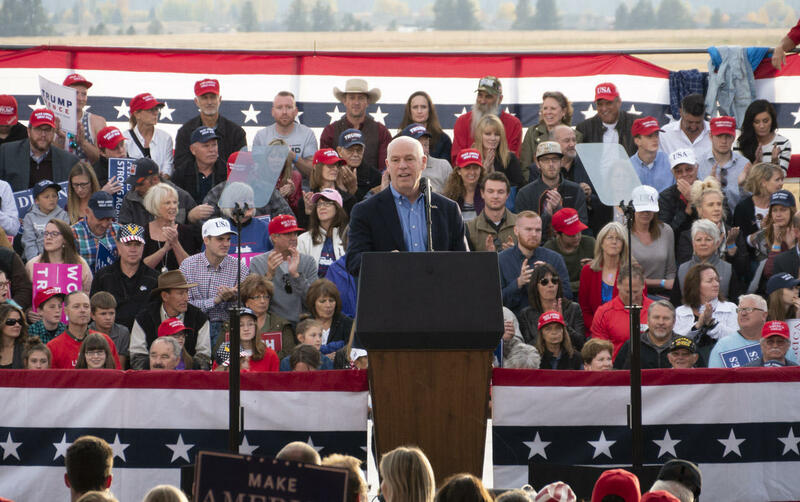 Trump’s speech wandered between the hallmarks of his presidency and campaign but always returned to what he framed as a looming threat of danger if his party lost power in D.C.
Greg Gianforte helps warm the crowd up before President Trump arrives at a Missoula, MT campaign rally, Oct. 18, 2018. After the rally I met Janus Zohner from Boulder. She stood staring at Air Force One on the tarmac as the crowd cleared out of the aircraft hanger. She said she’d never been involved in politics before Trump. Zohner says her favorite part about Trump rallies, and she’s been to two now, is the laughter he brings to them, like when he teases Gianforte about body slamming a journalist. “This is the way he communicates with people,” Daniel Conger says. Conger drove over from Spokane for to see Trump. The Trump family is coming back to Montana next week, when the president’s eldest son will stump for Matt Rosendale in what’s billed as a two-day bus tour. Recent polls call this year’s Senate race a toss-up, some political forecasts give Tester a slight edge. Celebrity appearances on behalf of candidates create new media impressions for free in what will be the most expensive Senate race in Montana history. More than $45 million has already been spent by the candidates and outside groups supporting them. As President Donald Trump stoked the crowd inside a hangar at Missoula’s airport last night, a small group of protesters mixed with some of the people who didn’t make it inside. A couple dozen of the several hundred people outside milled around a police barricade about a mile away. Thousands of people turned out for a campaign rally featuring President Trump, U.S. Senate candidate Matt Rosendale, Sen. Steve Daines and Rep. Greg Gianforte in Missoula Oct. 18, 2018. At the same time, a "Love Trumps Hate" rally was happening across town where organizers registered people to vote, marched to the polls, danced and rallied in opposition to the president. Check out some pictures from each rally here.